advocate for legal accountability: Barack Obama letter to STGlascoff re my 2005 report, "Big Pic re Legal Reform, All Topics, but Esp.Family Issues"
Barack Obama letter to STGlascoff re my 2005 report, "Big Pic re Legal Reform, All Topics, but Esp.Family Issues"
Note one comment in letter- "It is unfortunate that family courts can often be places that hinder, rather than help, the broken families who enter them, and this situation must be addressed. In the past few years the nature of this problem has become increasingly apparent, and reform legislation is pending in state legislatures across the country." 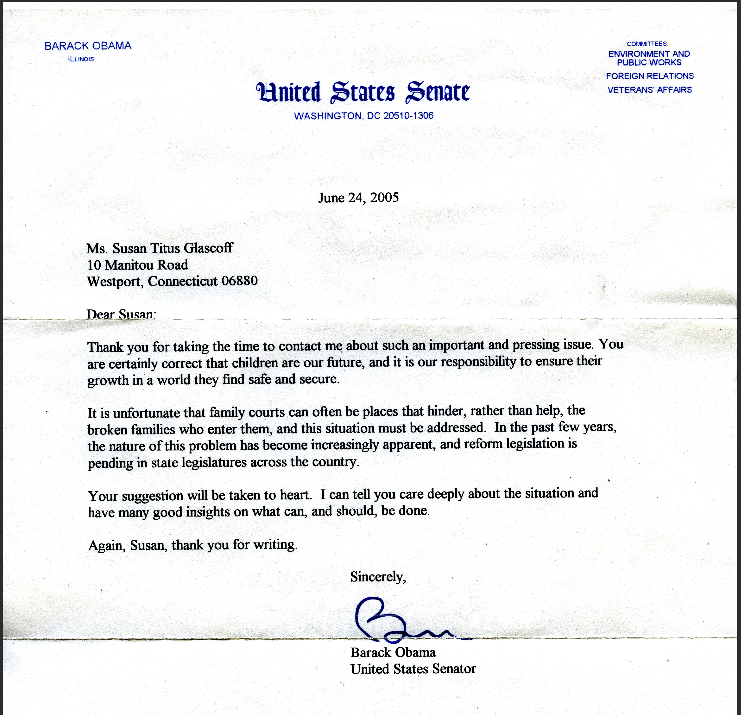 "Then Senator" Obama's letter is dated June 24, 2005 & was in response to lengthy highly documented report I sent out to many senators, media, etc. (now about 200, though later half only received excerpts) about increasingly urgent need for legal accountability, no matter the topic, but especially as relates to divorcing families. My report included brief summary letters (one page summary of their noted published books, other side a list of specific reform suggestions for courts, esp. divorce/family courts) from about 10 prominent authors dealing with human relationships, some directly with court issues. It was well-known that the NY Matrimonial Commission (see copy of speech I gave to them in one blog entry) was expected to report their two-year study findings in the upcoming fall and that they were hoping to make it a national model. It did come out in the fall of 2005, but a retired prominent attorney (whose father was one of the founders of the American Bar Assn.) said (in conjunction with the president of the National Coalition for Family Justice - and note I am Exec. Dir. of its advisory bd) that all the commission accomplished was " moving the deck chairs on the Titanic." I sadly agree as do many others, and ditto other reports that were published, though some may have made a bit more progress. So I repeat the mantra in the report- OUR KIDS KANT WAIT, SO NEITHER CAN WE! "Nothing is more important than what happens to the children. If there is hope for our children, there is every hope. If there is no hope for our children, there is no hope at all. The future of our world depends on the kinds of people today's children turn out to be." Italics are his. It has gotten back to me that people are questioning my claim that I have been a public advocate for over 40 yrs. Please read one entry that says it lists about 7 letters in response to NYT Oct. 5, 2008 real estate Key Magazine article (result of interview requested by me, and author was Ruth Padawer, that took 7 hours- me, Taub twin sisters, Katalin Pota who is tenant in Simon Taub's building- of Taub divorce case, noting that I've been a very active public advocate as long as they've known me, two over 35 years. Simon Taub was also interviewed, but we presented irrefutable documentation re his federal fraud convictions, etc.) noting appalling distortions & omissions indicating intent to mislead. I will also try to have scanned in and entered as another blog entry a letter I have from the president of the National Education Association (NEA) in 1986 re my national education project. I humbly quote the opening sentence - "Oh! If only your enthusiasm and insight could be bottled and shipped everywhere in the United States." My earlier advocacy no longer has documentation, though you will see reference to my national stove safety project in late 1970s mentioned in 2 of above 7 letters. I'm not including data re other more recent projects as this blog (or even some of the earlier data re legal project) is supposed to be about legal accountability which I have been working on for 8 years. In late 1980s I received an invitation to enter Sarah Lawrence College's graduate health advocacy program because they had heard about my advocacy. In the early 1990s I received an invitation to submit an application to join Who's Who of American Women, but I declined as I didn't (and still don't) want to be a public person. In 2005 I finally decided that being too private might be hindering my advocacy, so now I am member not only of the above, but of Who's Who in America, Cambridge Who's Who (including last 2 yrs their professional of the yr. for advocacy), and Kipling's Who's Who. Thanks for sharing this great post. You have to match your skills, abilities, experience and accomplishments with the ideal job and response letter for interview invitation for verify your claims to make the search complete. That is where the resume comes in.